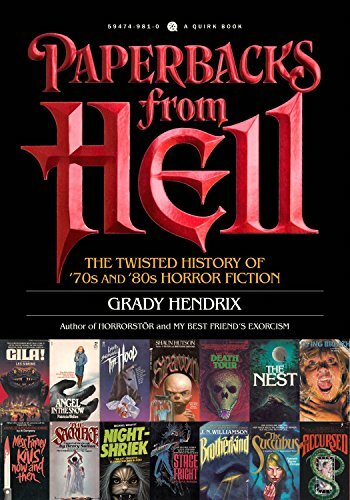 Grady Hendrix has been making quite a splash in horror fiction over the past few years with his comedic horror novels Horrorstör and My Best Friend’s Exorcism. With his new book, he breaks into nonfiction territory, taking a passionate glimpse into history of the horror genre itself. A thoughtful examination of two decades that saw the major boom of dark fiction, Paperbacks from Hell is as much a celebration of the genre as it is an introspective look into its history. This book is split up into eight chapters, each covering a major, overarching subject, within which many different trends in horror fell. Although the history of the genre could arguably be broken up into a variety of topics, tropes, and subgenres, Hendrix’s categorizations climb up and down the timeline of releases, covering the late 1960s and up through the early 1990s. The first chapter, “HAIL, SATAN,” covers the explosion of devil-themed fiction that followed in the wake of the unholy trilogy that arguably kickstarted the horror boom: Ira Levin’s Rosemary’s Baby (1967), Thomas Tryon’s The Other (1971), and William Peter Blatty’s The Exorcist (1971). In this section, books exploded with tales of satanic cults, demonic possessions, and appearances by the old devil himself. “CREEPY KIDS” is exactly what it sounds like. Beware the children! Possessed youth, bad seeds with murderous intents, alien spawn—it’s all here. This chapter starts with an obvious but important novel of a demonic child in David Seltzer’s The Omen (1976), and works its way up through many lesser-known titles within the trope. “WHEN ANIMALS ATTACK” is about much more than the various great white sharks and Saint Bernards that gorge themselves upon terrified victims. Everything from orcas, crabs, moths, and even slugs and caterpillars are out to kill you. “REAL ESTATE NIGHTMARES” is largely, of course, about the classic haunted house. The 1970s were rich with tales that turned to the home as a source of horror, and although Stephen King’s The Shining gets an appropriate shout-out, Hendrix generously dishes on the book that preceded (and inspired) it, Robert Marasco’s Burnt Offerings (1973). There also is plenty of coverage of Anne River Siddons’ The House Next Door (1978), and of course, The Amityville Horror series. In “WEIRD SCIENCE,” Robin Cook’s novels of cautionary medical terror are highlighted. However, familiar scientific realms aren’t all that Hendrix gets into here—he covers a wide range of related subjects, from alien invaders to computer-generated evil. “GOTHIC AND ROMANCE” covers the legacies paved by V.C. Andrews and Anne Rice. Vampires, castles, and old families with many skeletons piled in their closets hold reign over this chapter, spinning many a varied cobweb of assorted combinations of tropes. What’s more, however, this chapter also covers “The Rise of the Blockbuster,” and how movies and bestselling books began to shape and direct the future of the genre. “INHUMANOIDS” gets into the explosion of tropes that were summoned, perfected, changed, melded, or created within horror. At this point, just about anything and everything was fair game, and was essentially the frenzied, and penultimate, stage of the horror boom. And finally, “SPLATTERPUNKS, SERIAL KILLERS, AND SUPER CREEPS” sees both the climactic shift of horror into more mainstream subgenres of suspense and thrillers, and subsequently, the slow, painful decline of big publishers specializing in full-blooded horror. Many a horror aficionado rolls their eyes or looks down their nose at most of the books that came out in this period. This owes largely to the fact that the ideas at work are often so over-the-top in both concept and presentation that the books are absurdly cartoonish. Hendrix is quick to point all of this out, again and again, in every chapter—but he makes it clear that he has quite a lot of affection for these ridiculous tales of terror. Never does he throw a book into the spotlight purely to mock it; rather, the reader can practically feel his elbow nudging out of the pages to welcome a collective adoration of these many wonderful (and sometimes wonderfully awful) books. Aesthetically, Paperbacks from Hell is monumentally pleasing. Printed on glossy paper and featuring a fittingly embossed cover, everything from the fonts to the layout is professionally and handsomely presented. And speaking of covers . . . The real icing on the cake of this book is its page-to-page plethora of so very many lurid book covers. Screaming people, snarling beasts, lurking figures, strange beings, gaudy titles, catchy taglines—and the blood, so much blood! Finally, this book features detailed appendices that highlight a number of authors and the various cover artists. These cement Paperbacks from Hell as an absolutely beautiful showcase of this period in publishing, and make the reading experience even more enjoyable. There is little doubt that, in the wake of this title’s publication, many of the featured titles will begin to disappear from various used bookstores around the world, only to reappear—with ever-increasing prices—online. If you have a box of old, “trashy” horror novels in your basement, don’t get rid of them just yet—and don’t think that they’re all necessarily trashy, either. Horror fiction is alive and well, and Paperbacks from Hell is a grand, affectionate, and informative celebration of the genre.